Home » movie » 2012: It's the end of the world, oh noes! 2012: It's the end of the world, oh noes! I watched this film with my parents after winning a bet against my Dad over the Pacquiao vs. Cotto match. :) It was this or New Moon (which I ended up watching anyway *sweatdrop*). 2012 is a 2009 film directed by Roland Emmerich (Independence Day, Godzilla, The Patriot, The Day After Tomorrow, 10000 B.C.) It tells the story of how in 2012 the world as we know it is going to end, initially due to solar flares which cause the earth's core to rapidly change temperature, which in turn causes earthquakes and tsunamis. The governments of the world race against time to construct arcs which would serve as shelter for the survivors of the flood that would engulf the planet. The film features a star-studded cast: John Cusack, Chiwetel Ejiofor, Amanda Peet, Oliver Platt, Danny Glover, Thandie Newton and Woody Harrelson. The movie operates on the big disaster movie formula, of which Emmerich is apparently an expert, and it works. 2012 has a little of everything: romance, action, suspense, humor, tragedy, drama, and even a moral lesson. I like that it seems to draw inspiration from the bible story, Noah's Ark. The computer works are awe-inspiring. CGI, baby, and it's CGI done right. Where else can you find entire cities wiped out by earthquakes and tsunamis or crumbling landmarks heading straight at you? Oh right, in that other disaster movie. But 2012 makes the most out of its $200 million budget and what it has to show for it is nothing short of apocalyptic. Woody Harrelson has got to be my favorite. The guy plays deranged, conspiracy theorist like a pro. What gets me even more is the fact that his character, Charlie Frost, has an actual website where he posts his conspiracy theories about the coming disaster. It's part of the movie's viral marketing campaign apparently but I think it's hilarious. For all its entertainment factor, 2012 is made of cheese. 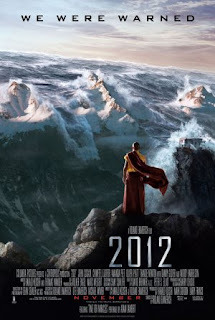 2012 is one disaster movie that does what it's supposed to: entertain. But if you expect high-brow action and intelligent dialogue, look somewhere else.